Here is how the river metaphor might work as a way of thinking about the “course” of history. Rivers have tributaries — rivulets of water flowing down hill into the broader concourse. History has “streams” of contributing events that lead to the larger outcome — the confluence of developments in the French medieval rural economy, the development of the fiscal crisis of the Ancien regime, and the emergence of a town-based bourgeoisie, for example, coming together to contribute to the unfolding of the French Revolution. There is a seeming unity to a river over time, even though the constituent water simply passes through continuously; analogously, one might view history as a “stream” of events that individual humans pass through, constituting a larger and more stable historical current. (Though of course we won’t forget the Heraclitus paradox.) Rivers are to some extent constrained — by existing topography, but also by human artifacts (dams, levees, flood walls). Historical developments too are constrained by circumstances such as agricultural productivity, population levels, and warfare. Rivers sometimes change their course — for example, the frequently changing course of the Yellow River over many centuries. But more commonly they become longstanding features of the terrain over centuries or millenia. Analogously, there is at least the semblance of long, steady periods of continuity of human affairs within human history — interrupted by crises and turning points. (See an earlier posting on the idea of a turning point.) Rivers have a direction of flow — from north to south, from high ground to lower ground. And some interpreters of history have argued analogously for a direction of change in history as well — towards “progress,” “modernization,” greater administrative intensity, higher standards of living for the population, or greater democracy, for example. And rivers have a powerful momentum of their own — we can be swept away in the currents of the Mississippi River, as John Reed was swept up in the events of the Russian Revolution. The river metaphor captures some of our intuitive thinking about history — tributaries, currents, stretches of turbulence. But it also conveys a necessity or inevitability that fails to come to grips with the deep contingency of history. A river has an inexorable course of flow — from high ground to low ground. And the topography essentially determines the shape and configuration of the river bed. This metaphor suggests that history too has an inevitable course or direction — which is profoundly untrue. So here is a third possible metaphor for history: history is an accumulation of pathways and contingencies that embed human action over time. I find that this metaphor works well as a way to characterize the course of history. Paths are created by purposive agents, going somewhere with an understanding of the topography. Pathways become roadways, and they become systems of constraint and opportunity. 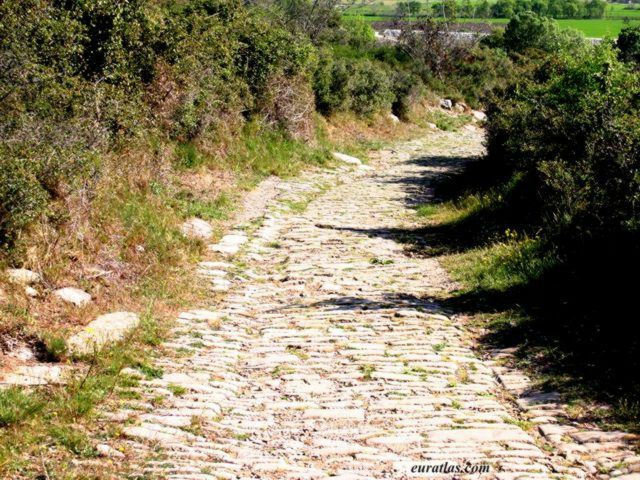 And they sometimes become the elements or segments of larger systems with long historical and human consequences (for example, the Roman road system illustrated at Ambrussum above). Road systems illustrate the meaning of “path-dependence”; once the pathway exists, other routes across the terrain become less likely. And the metaphor illustrates as well the perpetual interaction of agent and structure that good historians almost always emphasize; the plasticity of social entities; the contingency of their specific properties; and their constraining power influencing human choices. But there is a diachronic aspect of the metaphor as well: the structures that constrain the present today are themselves involved in a temporally extended process of modification and accretion from yesterday to today to tomorrow. The road system continues to evolve in response to contemporary needs and wants, and presents a new set of constraints and opportunities to the generation to come. On this approach, history doesn’t have any ultimate directionality; it is simply the sum of a long series of inventions, actions, interventions, and accidents over decades or centuries. At the same time, it is subject to a degree of explicability, in that earlier moments of historical development set the stage for choices and inventions in the next phase. Outcomes are “path-dependent”, in that they depend critically on the circumstances and accidents of the past. But at the same time, there is a degree of “sunk costs,” social momentum, and embodied infrastructure that make some historical developments much more likely than others. « Is a rail network a social structure?